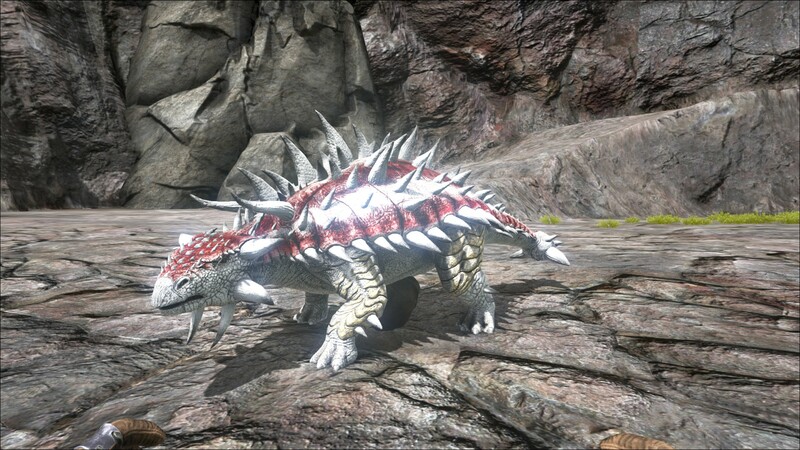 The Ankylosaurus (an-KYE-low-SAWR-us) is a species of Dinosaur in ARK: Survival Evolved. Unlike many of the herd animals on the Island, Ankylosaurus crassacutis tends to live in small family units. I believe they can afford to stick with smaller groups because of their incredibly thick skin, for which they're named. Despite not being among the largest of the Island's herbivores, Ankylosaurus is one of the more difficult creatures to take down. Its thick, armored skin seems to make it more than a match for several of the mid-sized predators that would otherwise hunt it. Reckless carnivores are just as likely to hurt themselves on Ankylosaurus' spikes, as they are to get hit by its tail. Without a doubt, the best trait of a trained Ankylosaurus is its enormously dense tail. This tail is powerful enough to quickly shatter the resource-laden rocks of the Island. One of the wealthier human tribes on the island utilizes a squad of Ankylosaurs in its mines and quarries. The creature's affinity for metal enables it to carry raw ore at an effectively reduced weight. 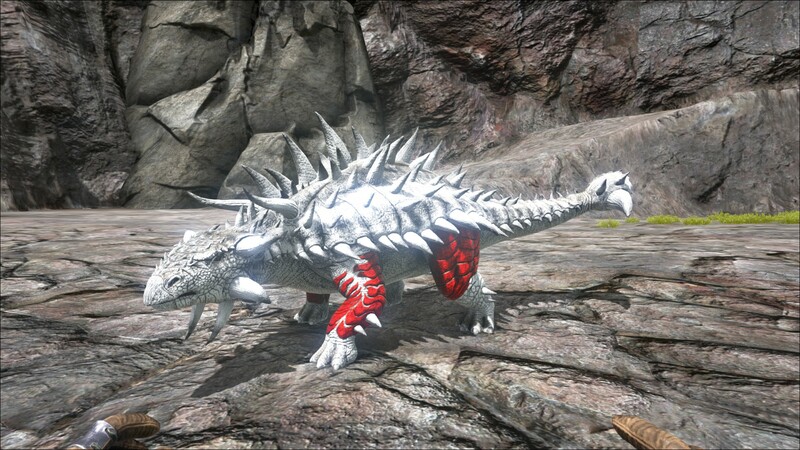 Ankylosaurus can be found peacefully wandering around the Island. They will not attack unless provoked, and since they can deal a devastating blow with their tail club if angered it is best for survivors to leave this beast alone. They have a very low movement speed on land but can move much faster in water. Ankylosaurus is a species of large, quadrupedal herbivore, adorned with a thick coating of spikes and bony plates. They are relatively low to the ground and protect themselves with an enormous bone club on the end of their tails. This section displays the Ankylosaurus's natural colors and regions. 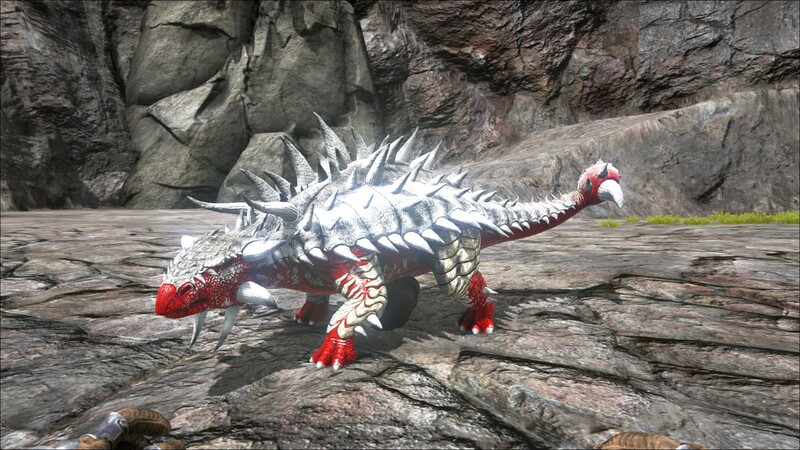 For demonstration, the regions below are colored red over an albino Ankylosaurus. The colored squares shown underneath each region's description are the colors that the Ankylosaurus will randomly spawn with to provide an overall range of its natural color scheme. Hover your cursor over a color to display its name and ID. For some reason, the Ankylo will always spawn with the same color covering the majority of its back (Region 0). The Ankylo is the only creature with this unique color which can be described as almost a "Butterscotch" or "Barley Corn" hue. This color cannot be replicated in the game, as it does not have an in-game ID. For example, "cheat SetTargetDinoColor 0 6" would color the Ankylosaurus's "back" magenta. Using the (PC), (PS4), (Xbox One), the Ankylosaurus swings its clubbed tail at the target. Ankylosaurus is relatively easy to knock out due to its slow movement speed. 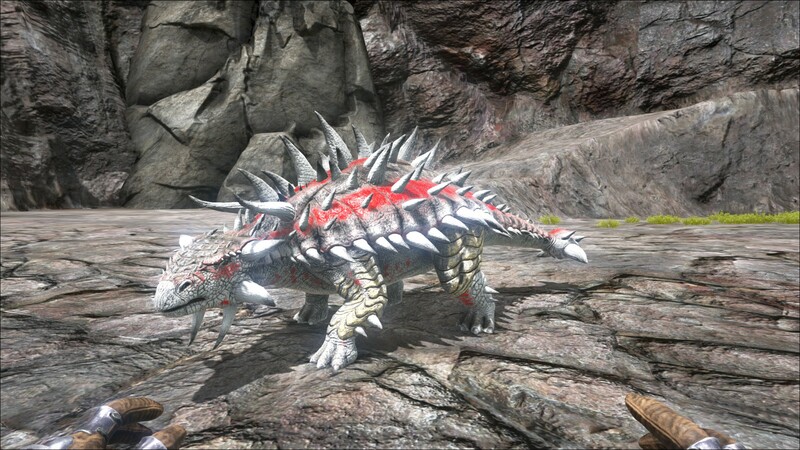 Even when attacked, the Ankylosaurus is easy to outrun, making nearly any ranged attack effective. The best method to knock it out would be using Tranquilizer Darts or Tranquilizer Arrows, but if neither are available then a simple Slingshot will do the trick but may take longer than a tranquilizer dart or arrow. Since the head of Ankylosaurus is covered in heavy armor, much like the rest of its body, it does not have a damage multiplier there- this means that it will take an equal amount of damage regardless of where on the body it is shot. This section describes how to fight against the Ankylosaurus. The Ankylosaurus uses its huge, literally 'bone-crushing' tail to attack its enemies. Its attack can be quite devastating if a survivor is wearing anything weaker than Chitin Armor. It is recommended then to either shoot it with a Ranged Weapon or use a Pike or Spear while circling it. The most successful strategy for killing an Ankylosaurus is to circle it while shooting it with a ranged weapon like a Bow, Crossbow, or any variety of gun. Be prepared for a moderately lengthy battle if you are using low-level weapons. Ranged weapons are recommended when fighting an Ankylosaurus. These weapons include Bow, Crossbow, Longneck Rifle, and others, though with some persistence a Slingshot will also work. Melee weapons are generally discouraged, though more nimble survivors might have success using Pikes and Swords if they are able to quickly move in and out of its attack range, or even bringing a Shield can work as well. 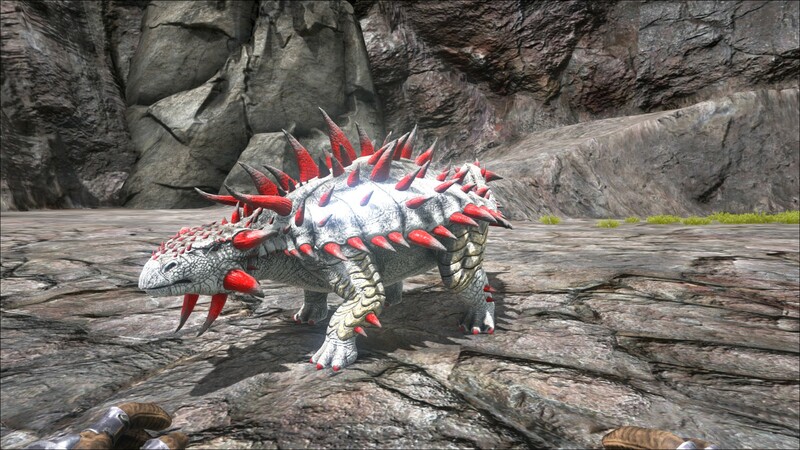 The Ankylosaurus uses its huge tail club as a defensive weapon: this attack has a fairly large range and can deal a respectable amount of damage, so keeping your distance is a must. The trade-off for its heavy coat of armor is a relatively slow movement and turning speed. Ankylosaurus can thus be easily outmaneuvered and overpowered. Gatherer: Excellent for collecting essential materials such as Metal, Crystal, and Flint. As of patch 256.3 (PC) Ankylos have a 75% weight reduction to raw metal in their inventories, allowing them to carry much more before becoming encumbered. (Level up Weight and Melee Damage). Can be transported by Quetzals or Argentavis for more mobility. (Level up Melee Damage) on the Ankylosaurus and (Level up Weight) on the flyers. Note: Increasing Melee Damage on Ankylosaurus yields more resources per swing; however, it does not increase area of effect as rumored. Until v246.0 it was possible to harvest resources with the bite attack when looking straight to a resource, which was significantly faster than the tail whip attack. The Ankylosaurus can be picked up by a Argentavis, Quetzal or Karkinos, and can harvest while picked up. If using Aberrant Ankylosaurus to harvest on the Aberration map, be mindful it is not immune to radiation and you will need to feed it Mushroom Brew every 120 seconds to keep it from suffering from radiation exposure when in irradiated areas of the map. The real world Ankylosaurus magniventris had much more smoothed armor than that of the Ankylosaurus depicted in the game, with the only prominent spikes being located around the head. The Ankylosaurus shown in ARK seems to more closely resemble Euoplocephalus tutus, a closely related dinosaur with a much more spiky appearance. The skull in Ankylo's dossier actually resembles Ankylosaurus' relative Tarchia rather than the actual animal. Using the bite attack during the tail slam will make you gather bushes instead of trees/rocks in a bigger area. The Ankylosaurus needs to be extremely close to each other to mate. The specific epithet crassacutis, meaning "thick skin", is an incorrectly constructed Latin compound; it should be crassicutis instead. When using the tail whip attack, there are 2 different animations that can occur with varying hitboxes. The regular swing will occur if facing to the right of the anky and the slam will occur if facing to the left. This page was last edited on 16 April 2019, at 20:40.